The author, Myndi Shafer, gave me a copy of this novel in exchange for my review. The success of the Beatles stemmed from the idea that they appealed to teens, but the lyrics had the depth of symbolism and emotion to sustain the fans that looked beyond their signature haircuts. Shafer gives the reader touchstones that will spark the consciousness of a younger generation in her work. This is going to be that work that a young reader will read again and again well into their elder years. For much of the book we know that Johanna harbors a vague power or secret for which she’s feared. She has a canine companion that she calls Joby, but of course, he doesn’t know that because she never speaks. She lives her life expecting Joby, a pet given to her by a friendly guard, to one day just leave her life and she will go on because that’s how life works. The sense of desolation from this character is astounding. She has plans but little hope and to live each day without that sense of something coming next punches the reader in the heart. Matthew asks Joanna who is skirting the edge of a dance floor if she knows why they dance. “Defiance…. It is our reminder that a good life—even if it’s a simple life, an underground life—is worth fighting for” (Page 78). The impact of what this society has lost is stark and vital and one that readers will understand is to be cherished. As Joanna melds with her society she starts to feel human again. The fear that has consumed her is easing and she allows herself the attraction and envy. Shafer very wisely shows us Joanna meeting Nat in both her situation as an inmate and as she is incorporated into the new society. The protagonists in Hanna, Hanna, One-and-Two are brutal, power hungry and raw. There is no pretty moustache twirling and pointed monologue at a figurative Igor. Their self-interest knows few bounds and really the world Schaffer gives us is an eat or be eaten wasteland. A mysterious device is in Annabelle Haier’s possession and she is not a woman to be denied but interestingly enough things may not be as direct as they seem. Readers will wonder with Johanna if the hard thing is perhaps the correct thing. There is an expert flow to Shafer’s story. The beauty of her construction is that it’s so well thought out. This is not an author who sat down and raced out a slap-dash story to post and make a few bucks. Hanna, Hanna, One-and-Two reads as a labor of love and I loved it. There are risqué language and adult themes in Hanna, Hanna, One-and-Two. The story is suitable for older teens and adults who love good stories. Myndi Shafer is a Kansas based author. 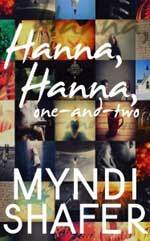 Hanna, Hanna, One-and-Two is her third novel. For more information about Myndi Shafer and her work, visit her website. You can connect with her on Facebook, Goodreads, Pinterest, Instagram and Twitter @MyndiShafer.